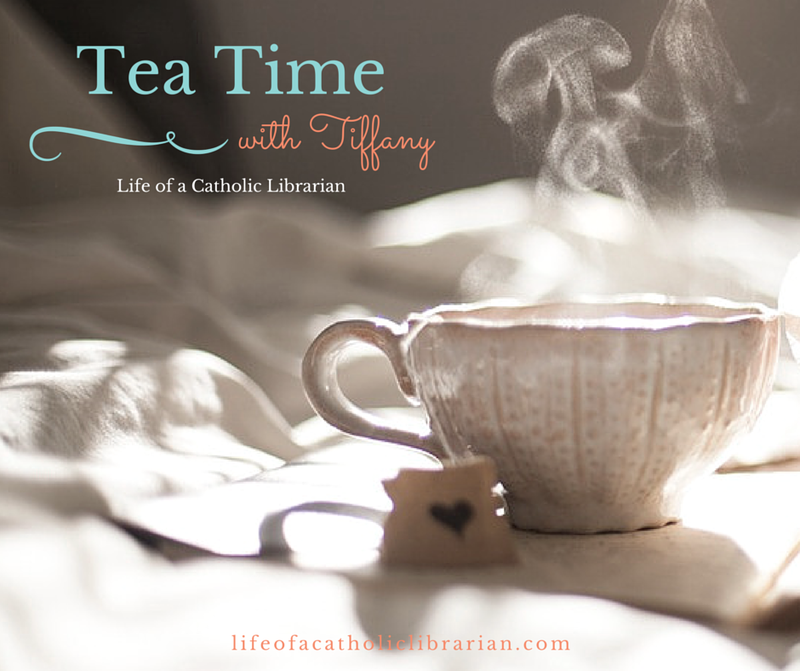 Life of a Catholic Librarian: Tea Time with Tiffany #40 - New podcast happiness, a few sappy tears, the importance of fellowship, & seeking your feedback! Tea Time with Tiffany #40 - New podcast happiness, a few sappy tears, the importance of fellowship, & seeking your feedback! I really enjoyed this one. I talk basketball, mystery shawls revealed, new podcast euphoria, the blessing of friendship, and how I need help planning my reading schedule. ;-) View on, dear viewer! Book Club plans? I need help, friends. ;-) Let's brainstorm! What's going on with you, guys and gals? How's your Lent going? What are your Holy Week plans? How have online friendships impacted your life? Any reading plan suggestions? I'd love to hear all about it!! Holy Week plans may be spur of the moment decisions this time around, depending on when baby decides to make an appearance! But we usually try to at least make it to Stations of the Cross on Good Friday as a family. This year, we will *finally* be going to the Easter Vigil because Jake is receiving his sacraments! I've been trying to talk mom into going to the Vigil Mass for the past 3 Easters. Online friendships are a relatively new concept in my life. But the ones that I have formed since the summer have been very fruitful! These amazing friendships (that I never would have thought possible) have helped me come out of my shell, be more comfortable with who I am, and been a listening ear when I needed one. Hi Samantha! oh my goodness, HOW GLORIOUS your Easter Vigil will be! I've gone the past 2 years, and I LOVE.IT. Henry has come with me in the past, but not sure if he will this year or not. I'm a bit bummed that nobody is coming into the Church in our parish this year, but the Mass will still be beautiful. All 4 of us go as a family on Easter morning, but there is something incredibly unique and tear-inducing about the Easter Vigil. I'm so, so glad that your new friendships have been working out so well for you. We're all so blessed! This tea time really resonated with me. And your Planned not Scripted which also touched on friendship. I've developed many online friends since I started blogging back in 2009 (Yikes!) And you are right. They are so much more than just people you know online. I've so wanted to meet you, and Cam from A Woman's Place, and Kris who used to keep a blog but it's touch and go as she has five kids (2 of whom are twins and another child with a disability). I meet so many lovely people online. In fact I've met two of my online friends in real life: Leila from Catholic Bubble and JoAnna who does a lot of online writing and keeps a blog called A Star of Hope. JoAnna and I saw Les Miserables with Hugh Jackman at the movies. Both of them live a lot closer than anyone else I know right now. So I live in Tucson now and it's looking to be permanent (no official announcements yet). This is a blessing in and of itself because I'm so sick of moving around. And it will allow me to develop close friendships instead of meeting people briefly and then uprooting again. My husband's closest friend is his boss so I have high hopes that that will lead to more and more opportunities for Hubby (and of course his boss). Speaking of friends....I joined a Bible group for Moms last summer. It's completely on the other side of town so that makes it hard to meet up with members individually but we persevere. We periodically use different books like the St. Faustina one and I am planning on recommending it to the group as a possibility after we finish this one we're working on. You'll have to tell me how you like it. And lastly, no plans for Holy Week. Maybe Good Friday. HB has spring break and Hubby will be out of town so I may be pulling my hair out by weeks end. Holy Thursday is what I normally attend but it's too close to the children's bed time. They are so goofy when they are tired. Holy Saturday is really long and I'm thinking Hubby may be too tired to wrestle with children. So maybe Good Friday? I love the shawl! It came out so well! Holy Week plans: Last Supper Mass on Thursday, a day trip out to my parents on Friday, Vigil on Saturday, and lunch with the in-laws on Sunday. In between that, lots of crocheting. Have started this project http://crochetkitten.blogspot.co.za/2015/11/the-jesse-tree-crochet-advent-calendar.html due to my Christmas-all-year New Year's resolution. I'm up to 15 figures so far. As for online friends, I joined an online group during my PhD and they are absolutely amazing. Would not have finished without them, and today some are closer to me than my real life friends. Hi Lara, so nice to see you! Your Holy Week plans sound quite similar to mine. 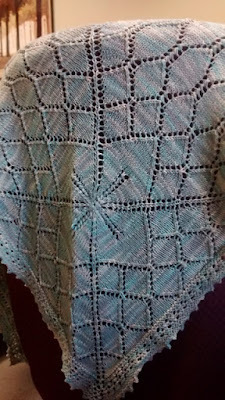 ;-) I am working on the crochet version of the Downton Abbey shawl now, and it's going pretty swimmingly! I'm working on the edging, and realized that I made a mistake at the beginning of a row (left out a small fan). I could have ripped back...but I didn't. :0 I left it and made the same "design element" at the other end, and voila! Instant fix. ;-) I'm about to finish clue 5 of that shawl and move on to clue 6 this weekend. Then clues 7 and 8 and real short, so I'm getting there! I LOVE LOVE your Advent calendar project! And good for you girl, sticking to it via a New Year's Resolution. We're all in this resolution business together! Your shawl came out great. I'm still working on mine. Clue 5 seemed like it took forever and I'm in the middle of clue 6. The last couple of weeks have been crazy here which might account for my lack of progress. Also do to that I'm not sure what my Holy Week plans are. I really enjoy going to Holy Thursday Mass but taking it one day at a time. Melanie, solidarity, girlfriend. ;-) I know, clues 5 and 6 are brutal. But bang in there, it gets better!